Students at Rakip Kocibelli Elementary School in the village of Qatrom, near the city of Korca in South-Eastern Albania celebrated the opening of their new school library made possible primarily through 100 English-language children’s books donated by Judith’s Reading Room. Today’s donation expanded the organization’s reach to Europe after its having established libraries in Afghanistan, India, Indonesia, and Nigeria. Peace Corp volunteer Dennis Dias contacted the organization in August, having been referred to it by the American Library Association. Dias, based in Qatrom, spearheaded the international collaboration which included the Embassy of France, Darien Book Aid, Friends of Albania and Judith’s Reading Room. “I think this is a testament to what the people can accomplish when they work together,” said Dias. The school marked the occasion by organizing a party in the school’s new library room. Elson Barci, a teacher at the school, worked throughout the celebration checking out books to a line of impatient students. “The opening of the library is an important project for the school because it’s a good way of helping the next generation and developing capacity in the village. You can see the desire in the children’s eyes to see all these books,” said Barci. Children decorated the room in preparation for the opening of the library with the American flag and a Judith’s Reading Room sign. Ten year old Sajmir, who stood in line for a book explained, “it’s my first time to see so many beautiful English books in one place.” An eager seven year old student approached a teacher and said, “I don’t know English, but can I take one? My cousin will explain it to me.” The faculty expects the new books will motivate students to read more and improve their English. Currently, grades three, four and five receive English lessons twice a week, and there are plans to expand English education in the coming years. 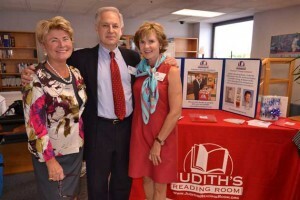 Judith’s Reading Room donated its 32nd library today to Good Shepherd Rehabilitation Hospital’s Recreation Therapy Room. The Therapy Room aims to return its patients to their highest possible level of function and independence. 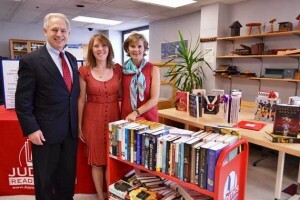 Today’s donation is comprised of 300 hand chosen books and a mobile cart with a total value of $7,562. The recreation therapy room is available to more than 200 individuals daily, including patients in the Rehabilitation Hospital, long-term care residents, residents of the supportive independent living apartments on campus and all of their respective families. The Judith’s Reading Room mobile library cart includes a variety of books that accommodate the diverse patient population, ranging from 18 to 80 years of age. Patients and their families will be able to benefit from a mix of new fiction, nonfiction, and coffee table books that have been obtained through book publishers and from a generous donation by Mr. and Mrs. Larry Gerhard in honor of their daughter, Kristen. The Morning Call’s video of Erin D’Amelio, Judith’s Reading Room 2012 summer intern on the creation of the library for Good Shepherd. Please visit Good Shepherd Rehabilitation Services for more information on all they have to offer.